Atlas Brace Presents - RV2 / What If? 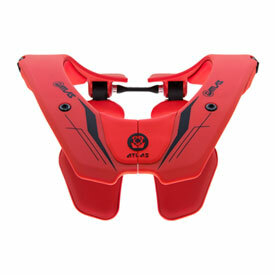 The all new Atlas Tyke Neck Brace provides top tier protection in a pint size package. Creating the best kids protection meant not making any sacrifices… The complete redesign is modeled after the sleek and sophisticated new Atlas Air adult brace, but has been reduced in size to fit your little daredevil perfectly. Features include a reduced new weight of 450g (1lb), redesigned body hugging frame shape to reduce brace movement and improve fit/range of motion, simplified Easy Open release system, stronger and stiffer long travel front suspension, back supports that appear smaller but increase surface area, lighter and tougher padding material in vibrant new colors, and a redesigned innovative tether that eliminates the need for multiple tools during adjustment. Split-Flex Frame – Vertical flex is the Holy Grail of mobility and comfort. The split frame helps mimic natural body movements to create the best experience possible. Easy Open – All new Easy Open system allows for quick, repeatable entry and exit with a simple push of a button, in any weather condition. Jr Smart Mounts – Hidden inside the mounting area are dual mounting holes to allow for 8mm of adjustment. Simply remove each axle & switch holes to adjust. Chest Suspension – All new long travel front suspension features 30mm of travel (a 300% increase), and is slightly stiffer to help dampen a wider range of impact forces. Colored Padding – Vibrant new padding colors are a perfect fit for any personality. Spine Free – All new back supports increase contact with the body by 8% over the previous model, and avoid your spine by sitting on the surrounding muscles. Sternum Free – All new chest support design is stronger, lighter, more compatible with chest protectors, and still sits around your sternum. Hybrid Strap – Combining the comfort of a chest strap, with the function and versatility of elastic X-straps. The best of both worlds. Feather Weight – The most amazing thing about wearing it is that you forget you’re wearing it. Surface Area – By sitting on 27% more of the body than the competition, comfort is maximized, and forces are distributed more efficiently over the body. Sizing Recommendations: (Sizing is based on chest circumference - distance around the chest, measured high on the chest, just under the arms). My son is almost 9 yrs old and loves it while riding his kx65. It doesn’t move on his shoulders and it helps a lot. Great neck brace, great value. Much lower profile than most other youth neck braces. Helps with helmet clearance. Love all the products fits perfectly!!! I have had one for adopt 3 years and I love it, I put grew it so I have to get the bigger one. The ATLAS Tyke is a nice brace. It fits well and is easy to get on and off. The only minus is the way the graphics fit on it. My 7 year old son loves the light weight and free motion movement. We took a chance with it, and couldn't be happier. Got this for my youngest. OK, as the name implies I have 6 riders....4 of us race harescrambles, the two youngest are 9 and 7 and both have different neck braces. My 9 yo has a Leatt Fusion...I like this set up, it is a quality piece of gear with excellent protection.....no complaints about this at all. My 7 yo, who just started racing has this Atlas neck brace. Our decision between the two had to do with the kids body size. I couldn't justify a Fusion for the youngest as the body armor part doesn't fit him quite right. This Atlas fits him great and as he grows, I only need to buy new body protection. This should last him for many years. The fit is excellent, ease of set up is excellent as well. One very nice thing about the Atlas is that it doesn't limit needed range of movement of his head (he can look around as needed). The Leatt does limit some movement of the head. Hopefully he never tests it, but he did crash A LOT at his last race and the brace never seemed to move (w/o straps) or get in his way. Light, (seemingly) comfortable, he LIKES it---which means he'll wear it---Overall a really good buy! I like the fact that this neck brace has range of motion does it protect if the helmet goes back like a face plant? BEST ANSWER: In the experiences my son has had, it does protect the natural motion of the head/ neck. Don't purchase too large so the rider can "grow into it". Worst thing you can do! Always purchase the correct size for where your rider is now. That goes for all gear. Too many times I've seen parents make the mistake of buying to big for their rider to grow into it and to save money and the child ends up getting seriously injured because their protective gear does not fit properly. Safety is always #1 priority. I would say it would provide good protection if fitted properly and you also have a quality helmet. As with all safety gear correct fit is very important and no gear will protect from every possible crash. That being said I would recommend the Tyke to family or friends. Our braces will help prevent injury (neck extension or compression), weather it be forward, back or side to side.. The big feature of our faces, is the brace will flex and disperses the impact and it's not ridged, as our competitors. I think it's a good neck brace, but since I have had mine I have broken two cables now that hold the back of the brace together, rocky Mountain was going to charge me ,so I contacted atlas myself and they replaced it at no charge. Yes very well!! We haven't had a problem with any of neck snapping any range of motion. Does it come with straps? BEST ANSWER: I dont remember an straps, I bought it two years ago and the boy still uses it every race and loves it! I bought one from here and it did come with straps. BEST ANSWER: yes, its a new 2018 model.